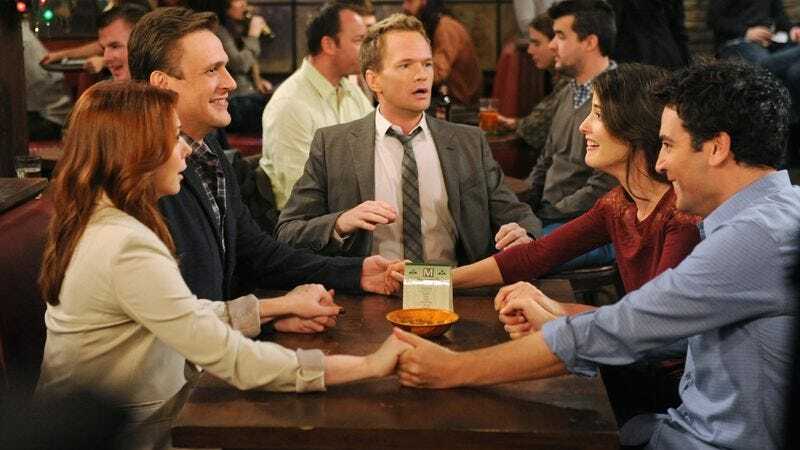 In news that should come as unsurprising, given the fact that heir apparent Partners utterly tanked and left CBS scrambling to find a way to prop up its Monday comedy bloc, Nikki Finke of Deadline is reporting that a deal has been closed for a ninth season of How I Met Your Mother. Jason Segel, who had been the holdout for a new deal, has apparently been talked into one more year, and the show’s creators and showrunners, Craig Thomas and Carter Bays, managed to get the answer they needed to plot out the continuation of the series endgame before January’s Television Critics Association press tour (as stated in this interview with Vulture). That means at least one more year of warm-hearted chuckles, wacky obfuscation, and strangely cruel jokes about fat chicks. Though Bays and Thomas have teased the idea that a ninth season might take place post-Mother, i.e. in the period after main character Ted finally meets his intended at Barney and Robin’s wedding, their need for CBS to make up its mind sooner, rather than later, suggests the two really do take the show’s title literally and the audience won’t meet said Mother until at least the series finale, if not the very end of the series finale, as Alan Sepinwall outlines here. Now, obviously, this could all be an elaborate misdirection, and viewers really will meet the Mother in the closing moments of this season’s finale, but it would be silly to bet on such a thing at this point. Season nine seems like it will be it, given Segel’s hesitation to even sign on for it, but that’s a problem the proverbial dump truck of money is made for, should CBS and 20th Century Fox (the studio that produces the show) still be having this discussion at the end of 2013. Fortunately, Bays and Thomas are coming off of what’s easily the best episode of the show to have aired in 2012, the highly-rated, critically-appreciated “The Final Page.” If they can keep that momentum going into 2013, viewers might actually welcome more Mother.